I think you will agree, making Herb Stuffing from scratch tastes better than Stove Top. No box can compete with the vibrant flavor of fresh herbs bursting in every bite! Is stuffing’s a wonderful thing. And the bottom will make you sing! Is that Stove Top’s not the only one! Ok pardon my lame poem. But let’s be honest, you’ll be singing it later. You’re welcome. For years, Stove Top stuffing has been my guilty pleasure. I pretty much require it at every holiday gathering. Yeah, I know it pretty much has the texture of wet paper mache, but there is just something I just love about herb stuffing! Stuffing is one side dish I rarely liked people’s made from scratch version better. I’ve never cared much for many of the additions people put in it. As far as my tongue is concerned, a good stuffing should be bursting with herb flavor, seasonings and perhaps some salty Parmesan. 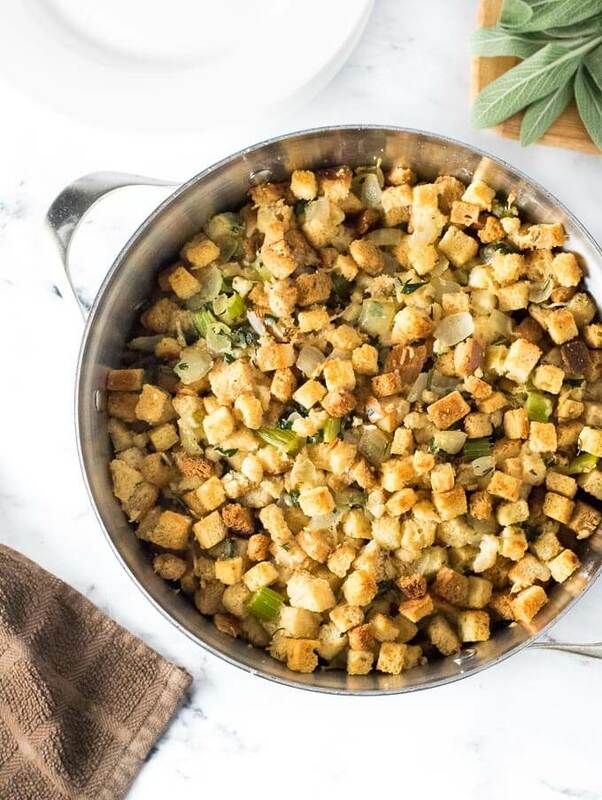 So finally a few years ago I set out to see if I could create my own version of Stove Top stuffing and created this herb stuffing made from scratch. Well, I am happy to report, I succeeded. It is better than Stove Top. 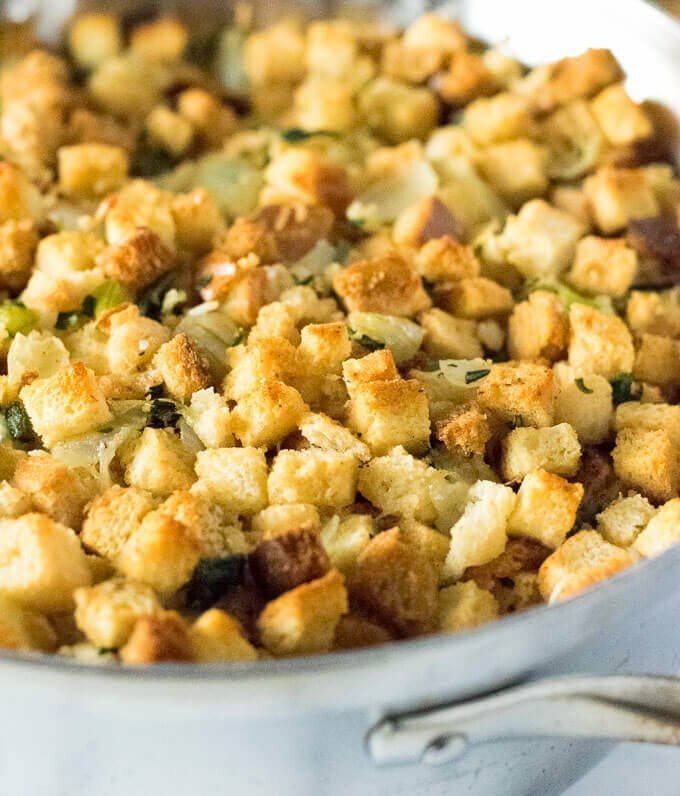 Why is my homemade stuffing better? It is baked, so it holds its shape better, it utilizes fresh herbs for a more exciting burst of flavor, and it is coated with a crust of Parmesan! What’s that you say? You don’t see any Parmesan cheese in my photos? Well, to be honest, I forgot. Oooooops!!! 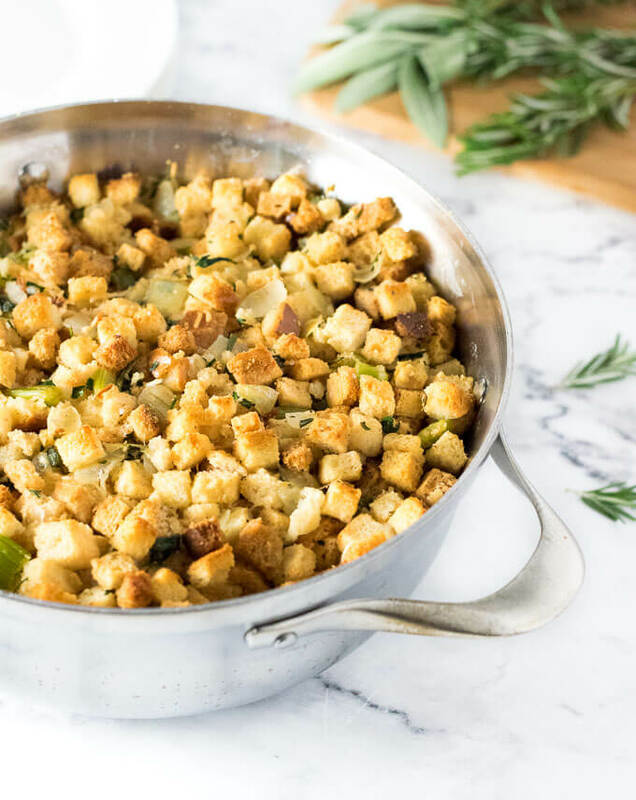 This Herb Stuffing from Scratch recipe is the perfect compliment to your holiday meal. It also reheats nicely in the microwave if for some reason you have leftovers. The above link is an affiliate link. 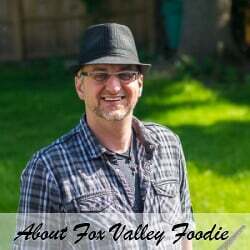 Any Amazon purchase made through this link help support FoxValleyFoodie.com at no additional cost to you. As far as my tastebuds are concerned, a good stuffing should be bursting with herb flavor, seasonings and perhaps some salty Parmesan. Add garlic, remaining butter, herbs and ground pepper and cook for two more minutes. Add croutons to a large bowl and pour stock over, then add butter mixture, and combine thoroughly. Transfer to 3-quart, or larger, baking dish and top with parmesan cheese and place in oven for 25 minutes. Cover the dish with aluminum foil for softer stuffing or leave uncovered for a crispy crust. 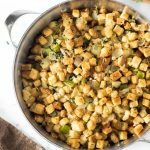 IF YOU LIKED THIS RECIPE you will love my Creamy Mushroom and Swiss Stuffing too! This Herb Stuffing recipe was originally published on FoxValleyFoodie.com December 5, 21015. If you enjoyed my Herb Stuffing from Scratch recipe then you should probably like me on Facebook and follow me on Pinterest too. That’s what I would do at least, because if you don’t get to know me but you still use my recipe it is kind of like taking candy from a stranger, and your mom taught you not to do that. Don’t disobey your mom, subscribe to Fox Valley Foodie today. This is very similar to my recipe with a few minor changes. I don’t use nearly as much butter in the body of the recipe and I omit the thyme. I divide the recipe in two parts, with one I sauté giblets and chopped mushrooms with the veggies, the other, just mushrooms(This keeps the vegetarians in our family happy). When I bake it I do so in a buttered or greased baking dish. For an interesting twist, I occasionally like to add finely cubed, and lemon water soaked, apple. This sounds delicious and so easy, Will definiatly use this for my turkey dinner next week. Thanks for all your great recipes!! PS… My husband really really loved your 2nd best chili!! It was so good and will be my rotation chili always! !